What could be more fun for the thrifty crafter than bringing to life some boring clothes with a little creative embellishing? This cute outfit that Flora is modeling for us was purchased from Ebay. 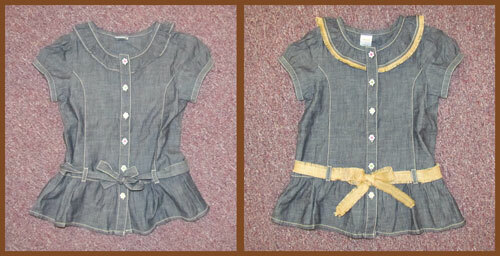 The basic denim shirt and the plain corduroy skirt were gently used and very affordable but they were, well… boring. 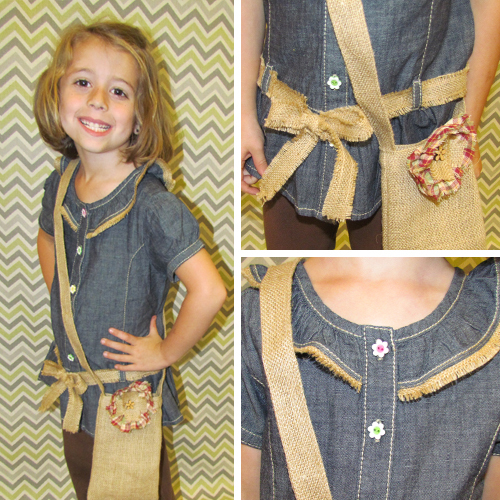 Just a little bit of homespun fabric and burlap made the two basic elements into a fresh, adorable outfit. I am featuring two of my Ebay upcycles in this post and some basic instructions for each one. I hope this will inspire you to look at boring clothes as a canvas just begging for embellishment. This is a fun and rewarding challenge and I’m sure you will come up with some amazing embellishment ideas of your own. 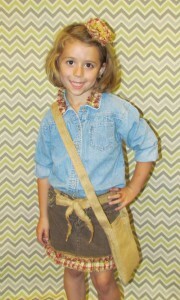 To the denim shirt I added a cute ruffled homespun embellishment on the collar. It’s important to use homespun here because it’s the same on both sides and so the plain back side won’t show in the ruffles. We tore a long strip of homespun that was just a little narrower than the collar. Tearing is much preferred over cutting with scissors because it will keep the edges straight with the plaid and it will not ravel beyond the first thread or two when it’s torn. This long strip doesn’t need to be in once piece, you can connect various strips with a seam. If you tear your strips so that the plaid will match up, you won’t even see the seam. The long strip of homespun was loosely gathered by stitching down the middle with a long stitch and then pulling the stitch thread from the bottom side to ruffle it. This “ruffle” was then stitched directly onto the top of the collar from one side to the other. Just cut the ruffle when you get all the way across the collar. Once it’s washed, the cut edges will soften to look like the torn edges. 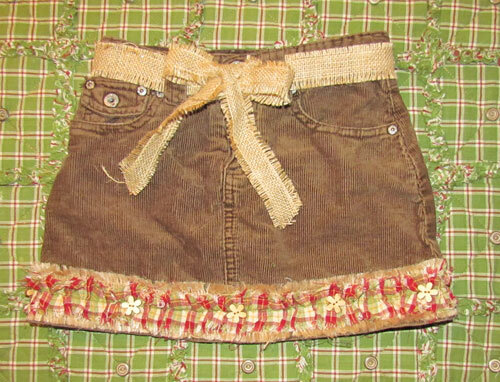 For the skirt, I stitched a strip of the 2″ Frayed Edge Burlap Ribbon onto the bottom edge. Then I added another strip of the ruffled homespun which was created exactly the same way as the ruffle on the shirt collar. I overlapped the ruffled just a bit at the point where the two edges met. Then I stitched on a few flower shaped wood buttons to give the skirt some whimsical detail. A roll of our 1″ Frayed Edge Burlap Ribbon was used to make the tied belt. 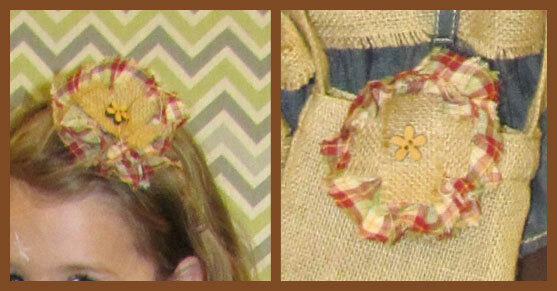 By the way… our Frayed Edge Burlap Ribbons are great for adding some burlap to your sewing projects. It has no wire and the edges are frayed and then stitched securely so that they don’t continue to fray while you handle it or wash it. The flower bow in Flora’s hair was super easy! I started with a gathered a 2″ strip of torn homespun again but this time I did the stitching on one side. I pulled this tight until one side of the strip was closed up and the other side spread out like a flower. If your strip is long, it can overlap some or if not, it’s ok to just meet the ends together. I glued the two ends down and put some glue on the back side to hold the center part in place. This is the outer part of the flower. Then I cut a couple of pieces of the 1″ Frayed Burlap Ribbon and placed them over the center in an “X” pattern and glued into place. Finally I put a cute button to match the buttons on the skirt in the center of the burlap X and glued that into place. I then stitched this flower bow onto a simple bobby pin which allowed me to use it in Flora’s hair on as an embellishment on her burlap bag. This little chambray shirt was another used Ebay purchase that I picked up very inexpensively. It was actually pretty cute as it was but with just a few simple additions, we made a super cute shirt that coordinated with Flora’s burlap shoulder bag. First I trimmed off a thin edge of one side of some 1″ Frayed Edge Burlap Ribbon and stitched a zig zag stitch onto the raw cut edge to prevent further fraying. This burlap “trim” was then stitched under the edge of the existing ruffle on this chambray shirt. 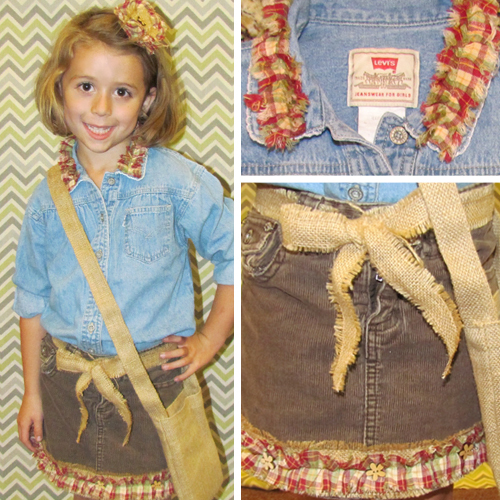 More of the 1″ Frayed Edge Burlap Ribbon was used to replace the fabric belt and that’s all there was to it! Here’s a nice before and after pic of the shirt. These particular projects were made last fall and Flora loved wearing her burlap clothes to fall events. Of course, I personally think burlap is a fun accent for any season. Are you inspired to embellish with burlap and homespun? Whether you browse through your closets or browse through garage sales or just browse online, you will surely find a perfect canvas for embellishing. So if you create something fun or interesting, please send us some pics! We love being inspired!